A new bespoke high-end website for Commercial Panels and Pressings has been given the thumbs up by the company. The UK’s leading supplier of powder coated aluminium insulated panels and pressings turned to Purplex for a brand-new website. And, as always, the leading full-service marketing agency in the construction industry delivered. The eye-catching site features detailed information on the products they provide, including panels, pressings, louvres and brackets, as well as latest industry news. With more than 30 years knowledge of the construction industry, Commercial Panels and Pressings are well experienced in providing high performance insulated panels suitable for an array of commercial builds and projects. The company manufacture all their products in-house at their 20,000sq ft headquarters in Northampton using the latest CNC machinery to guarantee exceptional quality. A spokesperson for Commercial Panels and Pressings said: “We have a reputation for delivering high calibre products throughout the UK, so customers can clad any commercial building promptly and to a high standard. 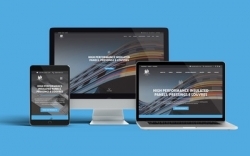 Adi Day, Purplex’s Digital Director, commented: “Commercial Panels and Pressings are a high-performance company, so we wanted to create a high-performance website for them.